For enhanced space and superb natural light, a uPVC bow and bay window for your home in Fleet, Hampshire, Farnham, Camberley, Aldershot, Basingstoke, Hook, Farnborough, parts of Berkshire, Bagshot, Lightwater, Surrey, Cove, Frimley, Yateley and surrounding areas makes the perfect choice. Get a free quote with our online quote calculator. 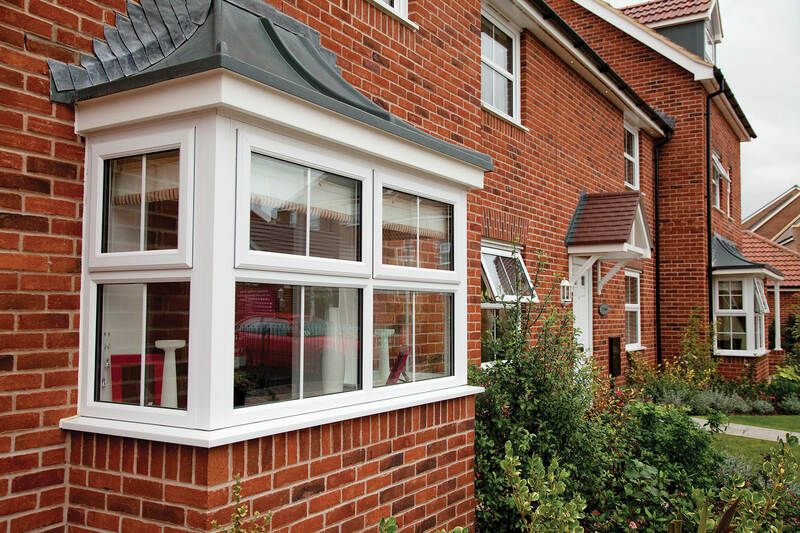 You can add a touch of elegance to your Fleet and Hampshire home with our gorgeous uPVC Bow and Bay windows from REHAU. They will enhance your living space, giving you a feeling that your room is larger, and natural light will flood in from their impressive aperture. Our double glazed bow and bay windows can be styled to suit you with options such as Georgian bars and a variety of hardware available. Added to this, you can also choose the colour of the uPVC, enabling you to match your windows to your home. Whether you like statement colours, or perhaps a more traditional finish, the choice is yours! These stunning windows offer an impeccable, long term performance, giving you year after year of pleasure while requiring only the bare minimum of maintenance. Whatever space you have for your new uPVC bow and bay windows, we can help. As our bow and bay windows are created using a clever system that attaches casement windows together, we can adjust the size of the double glazed bow and bay window to suit your home. With 3 and 5 faceted options available, you can make the perfect window! Our bow and bay windows combine high quality double glazing with an intelligently designed multi-chambered profile to provide you with superb energy efficiency. Heat loss is minimised by the thermal insulation inherent to these windows, which will keep your home warmer for longer, and in turn, lower your energy bills. One of the best features of the uPVC Bow and Bay window, is its highly secure design. It combines a wonderfully strong and rigid profile that is enhanced by larger, reinforced chambers with superb locking mechanisms. It achieves the incredible Kitemark standards of BS7950, guaranteeing peace of mind. We offer an impressive 10 year fully insured guarantee on our uPVC bow and bay windows. You can have peace of mind that your new windows will last the test of time, giving you outstanding performance year after year. Our guarantee is unique and comprehensive, and should you want to find out more, please contact us. You can use our completely free online quote calculator to get a bespoke price for your uPVC bow and bay windows in Fleet, Hampshire, Farnham, Camberley, Aldershot, Basingstoke, Hook, Farnborough, Bagshot, Lightwater, Cove, Frimley and Yateley. It is so easy to use, simply enter your specifications and our clever calculator will provide you with a virtually instant price. There’s no obligation, so give it a try!